Mike’s legal career has been devoted to representing management in workplace legal issues and representing businesses in high-stakes business litigation. Mike is known as an aggressive and passionate trial lawyer. He is admitted to the bars of Kansas, Missouri, and Georgia and has defended lawsuits in more than 20 states. Mike is often called upon by other lawyers to mediate and arbitrate their lawsuits. Mike serves as a Master in the Ross T. Roberts Inn of Court, an educational program sponsored by the United States District Court for Western District of Missouri designed to help enhance the trial skills of young lawyers. Mike also holds the rank of Rokudan (sixth degree black belt) in Okinawan Kenpo Karate and the rank of Shodan (first degree black belt) in Taiko Ryu Jujitsu and has more than 28 years of experience training in traditional martial arts. In 2013, Mike was awarded the title of “Renshi” (i.e., “polished instructor”) in the United States Kenpo Kobujitsu federation. In 2017, Mike and Deena Jenab obtained the dismissal of First Amendment retaliation claims against two university administrators in an issue of first impression before the Eighth Circuit Court of Appeals. See Lyons v. Vaught et al, 875 F.3d 1168 (8th Cir. 2017). 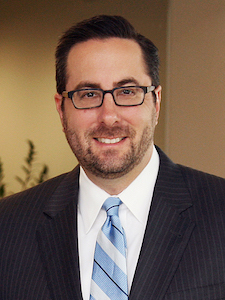 In 2017, Mike was lead counsel in an important appeal before the Missouri Supreme Court relating to the procedure for challenging timeliness issues in cases under the Missouri Human Rights Act (MHRA). See Tivol Plaza, Inc. v. Mo. Comm’n on Human Rights, 527 S.W.3d 837 (Mo. banc 2017). This case resulted in the Missouri Assembly amending the MHRA. In 2013, Seyferth Blumenthal & Harris’ trial team comprised of Mike, Paul Seyferth, and Kevin Karpin obtained an award of $162 million on behalf of the Health Care Foundation of Greater Kansas City against the Hospital Corporation of America (HCA). The trial court also ordered a judicially supervised accounting before a special master. Following the accounting and an appeal to the Missouri Supreme Court, HCA ultimately settled the lawsuit in February 2017, culminating in HCA’s payment to the Foundation of more than $203 million in damages and attorneys’ fees.This was Missouri’s largest judgment in 2013 according to Missouri Lawyer’s Weekly. In 2012, Mike was lead counsel in an important appellate decision relating to the charge-filing requirements in retaliation cases under Title VII. See Richter v. Advance Auto Parts,, 686 F.3d 847 (8th Cir. 2012). In 2011, Mike teamed with Paul Seyferth to defend a two-plaintiff age discrimination case that resulted in defense verdicts. These verdicts were designated by Missouri Lawyer’s Weekly as among the largest defense verdicts in 2011. In 2008, Mike and Paul Seyferth received a defense verdict in an age discrimination case tried in the Circuit Court of Jackson County, Missouri. Our client, a family-owned small business, “bet the company” on the outcome of this case. In 2007, Mike was lead counsel in a consumer fraud case tried in the District Court of Wyandotte County, Kansas. The case was widely publicized on local television after the plaintiff’s claims were covered by a consumer advocacy reporter. The jury found for our client, a national provider of funeral services. Elected as a Fellow in the College of Labor and Employment Lawyers. The College recognizes those who, by long and outstanding service, have distinguished themselves as leaders in the field of labor and employment law. Selected by The Best Lawyers in America as the 2014 “Lawyer of the Year” in Kansas City, Missouri in employment law – management. Included in The Best Lawyers in America in the field of labor and employment law. Named one of “The Best Lawyers in Kansas City” by Ingram’s magazine. Recognized as one of the “The Top 50” lawyers in Kansas City and one of “The Top 100” lawyers in Missouri and Kansas by the publishers of KC Magazine. Repeatedly named a Missouri & Kansas “Super Lawyer” by the publishers of KC Magazine in the field of labor and employment law. Repeatedly recognized by The Kansas City Business Journal as “Best of the Bar” in the area of labor and employment law. Rated AV® Preeminent by the Martindale-Hubbell peer review rating system. This rating is given only to those lawyers who have reached the height of professional excellence. Named by Chambers USA as a “Leading Individual” in the Kansas City area in the field of labor and employment law. Recognized by Missouri Lawyers Weekly as one of the 2008 “35 Up & Coming Attorneys” in Missouri. 10 The Labor Lawyer 19, The Defendant’s Perspective: Ethical Considerations In Representing and Counseling Multiple Parties In Employment Litigation (1994). 1 The Kansas Journal of Law and Public Policy 155, Warning! Collective Bargaining Can Be Hazardous To Your Health (1991).